Aggregate logs to a centralized location so you can easily and promptly troubleshoot problems. Get help quickly identifying issues and getting to the heart of your analysis without having to dig through hundreds of files. Your infrastructure is constantly generating log data to provide performance insight. Whether it is syslog, SNMP traps, or Windows event logs, these logs can provide crucial bits of insight to help with troubleshooting. Collecting, consolidating, and analyzing log file information with one tool can help you find the root cause faster. SolarWinds® Log Manager for Orion® is designed to be the log aggregation tool you need to keep your network and business up. By aggregating log files, you can have fast and reliable visibility to any potential issues, have your logs centralized in one location, and be able to more easily troubleshoot problems. Log aggregation tools can be most beneficial when they come with the capability to search and filter data effectively. Log Manager for Orion can let you filter your aggregated log data and refine it via intuitive, out-of-the-box filters. 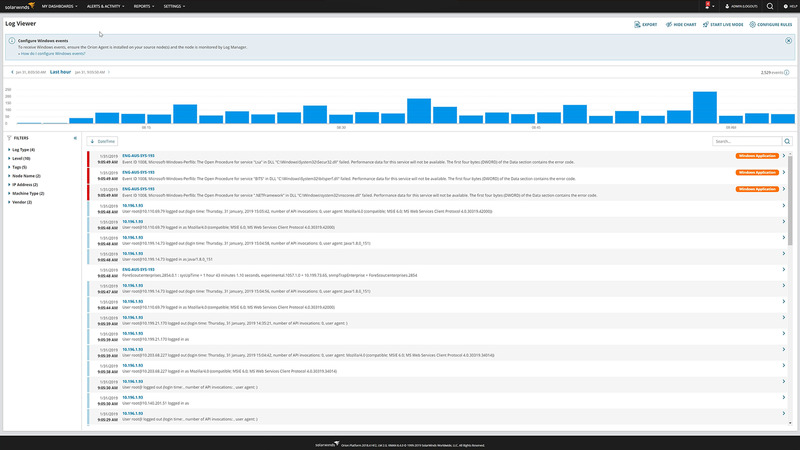 Using the powerful search engine that comes built into Log Manager, you can quickly find the log entries you need, which can help save you time and hours of work. Log Manager gives you the capability to quickly visualize volume, search results, and refine timeframes of aggregated log files via an interactive chart. Since Log Manager is integrated into the Orion Platform of products, you can seamlessly integrate your log file aggregation data directly into the Orion Platform console to view it alongside other critical network and systems performance metrics. Including aggregation insights in this log visualization tool can help give you a clearer image of your network’s performance. When an error occurs, and you refer to your logs to see what went wrong, you can end up searching dozens, or even hundreds, of files. When your logs are not consolidated, they will be dispersed across various locations, which can lead to further issues and wasted resources. Without log aggregation, your team can be at risk for not detecting potential issues, which means you can’t promptly troubleshoot them.